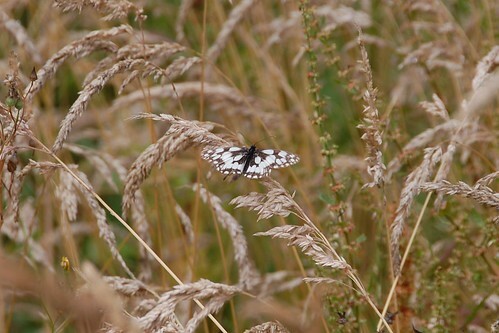 Marbled White in the long grass. 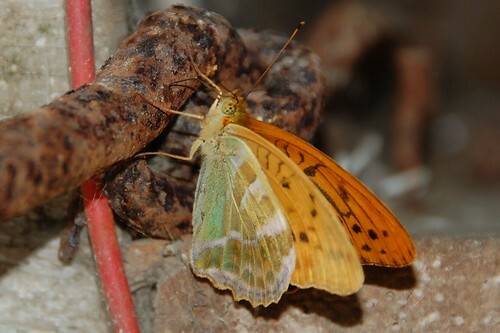 The butterfly situation still seems on the edge of invisibility towards extinction with very few sightings. Those we have seen have been skittish and nervy and hard to record. We've now spotted examples in ones and twos of the most common that we consider endemic here but the fields and rides seem strangely bare and underpopulated. It's to be hoped that the good weather of the last few weeks will have given these tiny stocks a chance to breed and replenish the population for next year but we've still not seen some of the sorts that have been frequently found here; the blues and coppers nor the White Admirals. Silver Washed Fritillary showing off. This big butterfly was a welcome sight and as we rarely have more than few of these it seems this group have done better than most during the horrible weather of the last eighteen months. He flitted around the yard teasing me to take his picture and eventually stopped for a rest in the shade of a building. I saw him again today, just as bold and beautiful. 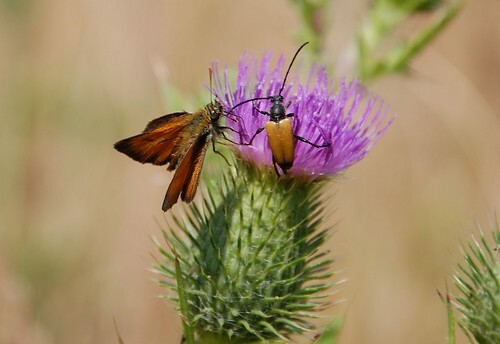 If there has been one species of butterfly that's been more frequent than usual it must be the skippers. We wondered if we were just noticing them more because of the lack of competition from showier insects but there really are hundreds of them, probably more than one species but I'm sorry to admit I'm not too good at telling them apart as yet and as far as I can see they are all the common type of Large Skipper. Beetles have been reasonably frequent sightings too, and there are many different sorts even by such coarse means of identification as wing case colours and length of antennae. To really name them accurately usually involves a lot of very close work and probably some dissection to determine various abstruse differences in the more delicate parts, not a subject I've much intention of mastering any time soon. 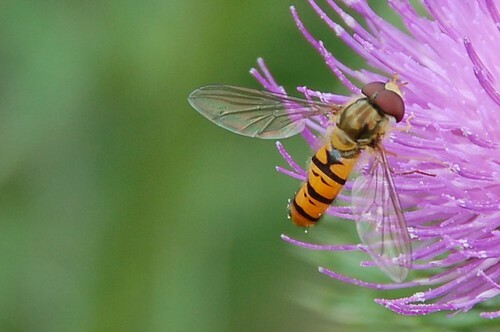 However something we realised over the weekend is that we've not seen a single ladybird or ladybird larva this year which is quite worrying. 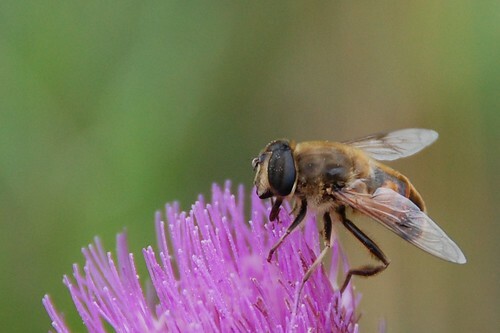 We do still have a lot of hover flies here and a useful purchase just made is a copy of Britain's Hoverflies by Stuart Ball and Roger Morris. I know, Normandy is not Britain but we're not far distant and the countryside probably has a lot more in common with the south of England than it does with the south of France. It's a very comprehensive book with lots of good pictures and extends the comforting hope that if we do find anything wonderfully novel here amongst our hovers there's a chance we can identify it.